President Donald Trump hosted dinner for president Maithripala Sirisena who is in the US attending the 72nd UN general assembly. 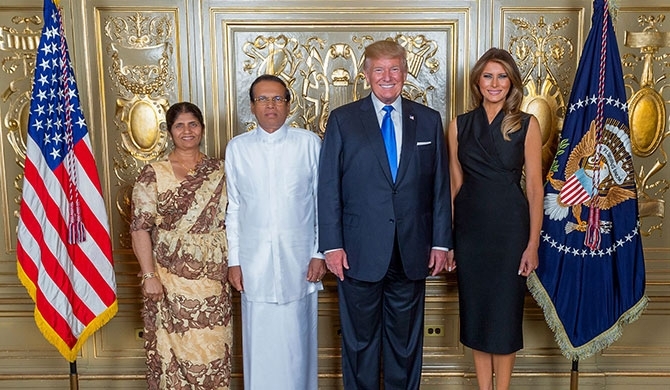 First ladies Melania Trump and Jayantha Sirisena too, participated.The two leaders had a friendly chat during the dinner, where president Sirisena congratulated Mr. Trump on his election as the US president.He also expressed sorrow over the natural calamities the US experienced recently. Describing Sri Lanka as a beautiful country, president Trump said the country has seen a clear transformation under the leadership of president Sirisena. He also extended fullest support to Sri Lanka.